When disaster knocks on your door, you’ll wish you had the Wen 56475. Do you know how to make the biggest mistake in the world? Float around in your happy bubble thinking everything is going to be okay, and don’t prepare for anything that might crop up. The reason it’s such a big mistake is because something always goes wrong, and I know because I’ve been on the end of it before. A well-priced generator geared towards homeowners. Features electric start, low-oil shutdown, an automatic voltage regulator and overload protection to maximize safety. CARB & EPA III meet requirements for sale in all 50 states. 223cc engine provides 4750 surge watts and 3750 rated watts. View or download the MANUAL for the WEN 56475 Generator. The rated wattage corresponds to the maximum wattage the generator can output on a continuous (running) basis. The surge wattage is defined as the maximum amount of power the generator can output for a short period of time. Most electrical devices, such as refrigerators, require short bursts of extra power, in addition to the rated wattage listed by the device, to stop and start their motors. The surge wattage ability of the generator is important and it compensates for the extra draw of power when starting and turning off your power equipment, appliances, gadgets and other electrical devices. 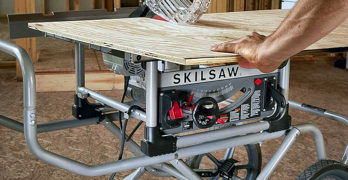 To learn more about wattage requirements read our in-depth buying guide for portable generators. I can’t remember the exact year, not that it makes any difference. It wasn’t a particularly bad winter, at least not compared to lethal ones, but when everything is turning to ice and you don’t have any power it’s not funny. I’ll always remember the few days my father spent all day trying to keep us warm and fed as the time I realized you should never gamble with your life. If we had logs ready to throw on the fire it would have helped tremendously, but none of those old school tricks matter any more. Not when it’s easy enough to keep a portable generator lying around to save the day in the event of an emergency. I haven’t used my one to save my family’s life yet, but who is to say what will happen this winter? Okay, we’ve covered all the scary stuff and I’m sure you understand when everything turns to pitch blackness in the blink of an eye because of a power fault, your generator will see you right by providing you with light. It will help with major things too, like when a storm or earthquake cuts off the power to your home when you least expect it. If you go camping you won’t even feel like you’ve left civilization, which is helpful if you love your creature comforts. Anyone with their own business might need power if the home they’re meant to be working on is showing no signs of human life. Living in the middle of nowhere with a lot of land surrounding you is great when you can wheel electricity around with you like a man who can control storms. I could go on forever about the benefits of portable generators, but I’m sure you know by now they’re important and they have many uses. What I do want to talk about is my favorite one, and if you remember my childhood story you’ll know I’ve tested out a lot. 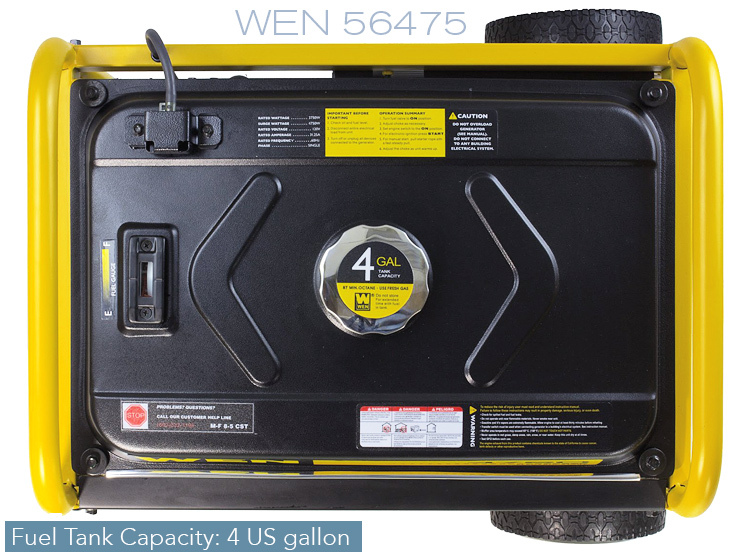 I can’t live without the WEN 56475 4740-watt generator, and with your permission I’d like to share why it’s at the top of my list. Includes all the tools you need to assemble it. Great package. Yanking on a pull cord doesn’t sound like such a big deal, until your fingers are freezing cold and they feel like they’re about to drop off. Nobody should have to exert too much energy starting a generator with the technology we have available today, and you won’t have to when you own the WEN 56475. It’s almost too easy to power it up, and with a quick tap of the electric start button it will kick into life. In case you’re not aware of the role a spark arrestor plays inside your portable generator, it essentially stops you from burning a forest down and engulfing your camp site in flames. When you’re dealing with combustible toys like the WEN 56475, it prevents flammable debris from being emitted. It’s great for anyone who loves going camping, and essential for taking a generator into a national park. I think you already could have guessed the generator would be able to keep things up and running, but it’s worthwhile mentioning it in case you think the machine is only useful for a select few things. Your lights, TV, and other essentials are all in good hands. That includes your refrigerator, because we all know a beer can help ease your pain when you lose power to your home. How often do you forget to fill your car with oil before you start noticing problems? Unless something is in plain sight we’re very forgetful creatures, but you don’t want to make the same mistake with your WEN 56475. Maintenance schedules become pretty important if you want to make sure your generator is still working when you need it most, and the digital readout will help you manage to remember everything. If you attempted to fall flat on your face right now, your instincts would snap into action and you would protect yourself. Your nose would be okay, but I can’t promise you won’t snap your wrists. Generators are machines, so how on earth could they possibly protect themselves? The 56475 can’t jump to the side if you try to push it over, but it can use its low-oil shutdown, automatic voltage regulator and overload protection to avoid dangerous safety issues. Thankfully, it comes with an easy to install wheel kit. The WEN 56475 isn’t just an expensive replacement for candles to help you see and keep you warm when the lights go out. I know I said workmen could carry it around in their van, but in actual fact it wouldn’t find it difficult to keep everything running on a small construction site. The 223cc OHV engine packs 4750 watts of peak power under the hood, and even its rates power sits at 3750 watts, so you’re buying a portable generator that should be respected. Well-constructed, efficient and great features. I wish they had these back in the past when I was in so much pain, but maybe I would never have grown to appreciate how important a portable generator can be. The WEN 56475 lets me sleep easy at night, whether I’m lying in my comfortable bed or in the middle of the woods in a tent. You’ve got to admit, for a portable generator at such an affordable price it has a huge amount of features squeezed inside. You should be aware that one of the drawbacks of this generator is that it’s a little louder than a more expensive model. The Noise Rating for this model is 67 dB at 22 feet. Unfortunately, WEN doesn’t provide an absolute noise level. It’s not the quietest portable generator available, but overall, you actually get a lot for your money and the reliability is very high with this WEN generator. Generator exhaust contains carbon monoxide (CO). This is a poison gas you cannot see or smell. If you can smell the generator exhaust, you are breathing CO. But even if you cannot smell the exhaust, you could be breathing CO.
ONLY use a generator outside and far away from windows, doors, and vents. These openings can pull in generator exhaust. Voice alarm warning. Connect via their app + 10-year warranty. Even if you use a generator correctly, CO may leak into the home. ALWAYS use a battery-powered or battery-backup CO alarm in the home. If you start to feel sick, dizzy, or weak after the generator has been running, move to fresh air RIGHT AWAY. See a doctor. You may have carbon monoxide poisoning. WEN has been around for over 60 years. 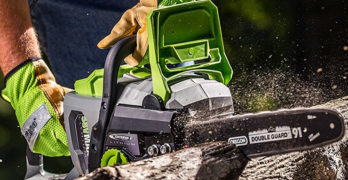 The brand may not be as recognizable as Black and Decker but they’ve toiling away behind the scenes refining their products and technology. Founded by Nick Anton back in 1951, WEN originally made its mark by helping bring tools and electricity together (putting the power into power tools). Our research and development team played a vital role in helping to develop a variety of common everyday tools such as the chainsaw, the electric soldering gun, the electric jigsaw, the electric engraver, and the knife and wet wheel sharpeners. WEN even pioneered random orbital technology; the technology seen in most polishers, waxers, and buffers today that gives cars everywhere the streak free shine they deserve. A very good entry-level portable generator for homeowners. View or download the MANUAL for the WEN 56180 Generator. Run your lights, TV, refrigerator, sump pump, and other essentials. Although the overall rated wattage of the machine is 3000 Watts, it is not recommended that you attempt to draw more than 2400 Watts (20 A) from any ONE of the 120 Volt receptacles. View or download the Generator Air Cleaner and Carburetor Removal. View or download the Air Cleaner Removal. View or download the CARBURETOR ASSEMBLY. View or download the WIRING DIAGRAM. View or download the GENERATOR PARTS. ✓TIP: The generator can run at its surge wattage capacity for only a short time. Connect electrical devices requiring a rated (running) wattage equal to or less than the rated wattage of the generator. Never connect devices requiring a rated wattage equal to the surge wattage of the generator. This can trip the circuit protectors (circuit breakers). I highly recommend getting the wheel kit if you purchase this model. For this model, you have to buy the Generator Wheel and Handle Kit (WEN 56410) separately. I’m not sure why they include the kit on the other models. It weighs 95 lbs, so I consider this kit essential. Try moving this around without wheels, good luck. View or download the MANUAL for the WEN 56400. Features low-oil shutdown, an automatic voltage regulator and overload protection. Voltage selector allows easy switching from 120V to 240V as needed. Spark arrestor for usage in U.S. national parks and forests. 212cc engine provides 4050 surge watts and 3500 rated watts. 4-gallon gas tank runs for 11 hours at half load. Low-oil shut down safeguards the unit from damage. View or download the CARB ASSEMBLY PROCESS. 389cc — 13 HP OHV engine provides 5,500 surge Watts and 5,000 running Watts. 6.5 Gal. fuel tank runs for 11 hours at half load. Features four 120-Volt 20 Amp 3-prong outlets, a twist-lock 120/240-Volt 30 Amp outlet (L14-30), and a car-charger-style 12-Volt DC outlet. Includes wheel and handle kit, NEMA L14-30 plug, and a 2-year warranty. Wheel kit, spark plug wrench, and NEMA L14-30 plug included. When the power goes down you’ll want one of these around. View or download the MANUAL for the WEN 56682 generator. Plenty of power to run a variety of appliances and power equipment. View or download the MANUAL WEN 56877 generator. View or download the WIRING DIAGRAM for the WEN 56877 generator. 420cc 15 HP OHV engine provides 9000 surge watts and 7000 running watts. 6.5-gallon fuel tank provides up to 9 hours of operation at half load. Easy ignition with the keyless electric start or by pulling the back-up recoil starter. Features four 120V 20A three-prong outlets, one 120/240V 30A twist-lock (L14-30), one 120V 30A twist lock, and one car-charger-style 12V DC outlet. Includes wheel kit, NEMA L14-30 plug, adjustment wrenches and a two-year warranty. The ultimate back-up generator. A stunning machine! View or download the MANUAL WEN 5613K 13000-Watt. This generator comes equipped with comprehensive safety features including a forced air cooling system and a low-oil shutoff to safeguard the unit from damage. The automatic voltage regulator helps create clean power to protect your electronics. Whether you need a generator for work or for natural disasters, this machine can handle pretty much anything. EPA III 4-stroke OHV twin-cylinder engine produces 13000 surge watts and 11000 rated watts, more than enough for a reliable source of standby power. Includes four 120V 20A outlets, one 120V 30A RV outlet, one 120/240V 30A twist lock, one 240V outlet, and one 12V DC car-charger-style outlet. 8-gallon fuel tank provides 7.5 hour run time at half load. Added wheel kit and handle kit allows for easy transportation and storage.